Neighbors at work at Blue Jay’s Perch Community Garden in Baltimore, MD. Photo Credit: Florence Ma. From community and rooftop gardens to cultivating empty lots, urban farming has been going on as long as there have been cities. But over the past decade or so, as city residents have become more aware of the environmental, economic and community benefits of eating locally grown produce, urban farming has become a topic of wide discussion that has captured the attention and imagination of a diversity of stakeholders — from high profile restaurateurs and community advocates to the United Nations and local city councils across the US. But does it benefit community, economy and environment? Have some of the virtues of urban agriculture been overstated? Weighing questions like these was the goal of a Johns Hopkins University study, “Vacant Lots to Vibrant Plots: A Review of the Benefits and Limitations of Urban Agriculture,” published in May by Raychel Santo, Anne Palmer and Brent Kim. Seedstock recently caught up with Santo, the coordinator for the Food Communities and Public Health program at Johns Hopkins’ Center for a Livable Future in Baltimore, MD, to dig deeper into the study’s findings. Seedstock: In your study, you found that the documented benefits of urban agriculture include its potential to “increase social capital, community well-being, and civic engagement with the food system.” Can you tell us about some of the places that you research, which provide evidence of these benefits? Raychel Santo: The D-Town Farmers in Detroit is a great example of how racially marginalized residents have been actively engaged in urban ag to provide fresh, healthy, and culturally relevant produce for their communities. As a reaction to the government’s failure to do so, they view their work as a way to advance food justice and food sovereignty. Strength to Love Farm, a non-profit urban farm in Baltimore, is another example of how leaders can work with the community to provide healthy food access and jobs to returning citizens in the neighborhood. Seedstock: Why do you think the benefits, or pitfalls of urban agriculture are misconstrued at times? RS: Urban ag initiatives are established with different, though often overlapping, aims and organizational structures. It can be easy to selectively choose the benefits from each type of initiative to suggest that urban ag can increase food access in food deserts, provide significant amounts of food to urban residents, offer educational benefits, support environmental sustainability, create jobs, and revitalize vacant properties, all at once. However, efforts that provide some of these benefits might not provide others. For example, larger-scale commercial operations, which may grow significant amounts of food, often don’t feed communities in need. And if they use high-energy inputs such as heated greenhouses in Northern climates, they probably won’t provide sustainability benefits either. It’s important to differentiate our expectations for different types of urban farm initiatives so that the benefits of each are not oversold. Moreover, within our current political climate, urban agriculture’s job-creating potential may be oversold in particular because it’s a relatively non-partisan goal. Yet there’s little evidence right now suggesting that it can create a significant number of jobs, let alone ones that provide a living wage. Seedstock: How can urban agriculture advocates best approach and win over the powers that be, particularly local residents? RS: Melissa Poulsen and Marie Spiker’s report, Integrating urban farms into the social landscape of cities: Recommendations for strengthening the relationship between urban farms and local communities, is a fantastic resource for helping urban agriculture advocates create projects that are accepted and embraced by communities. To gain community buy-in, they emphasize the importance of understanding neighborhood context, engaging local residents in planning, goal-setting, and decision-making, and creating opportunities for residents to be involved with the farm and access produce from it. 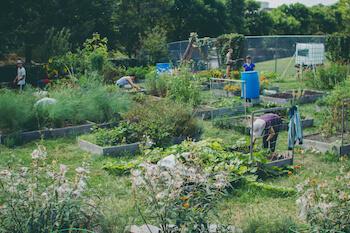 Seedstock: How can local governments best support urban agriculture initiatives? RS: Many local governments offer affordable vacant land to lease, access to water, and land trusts to ensure land tenure for the future. They could also provide grants and financial support to socially-driven urban ag efforts that concentrate on workforce training for at-risk youth, immigrants, and formerly-incarcerated people. Seattle’s city-funded P-Patch gardening program offers one model of how governments may support such initiatives. Seedstock: So, if urban agriculture is emerging as just one piece of creating food security, what are some of the other important factors? What would a truly food-secure city look like? RS: Financial access is probably the most important aspect of ensuring food security – all residents need to be able to afford adequate amounts of food that is healthy, culturally acceptable, and – if we want to ensure long-term food security – produced in ecologically sound ways. It’s important to make food physically accessible to residents, including access to grocery stores as well as food growing green spaces. Crucially, a truly food secure city would also ensure that residents have a voice in making decisions around the food system, which is where innovative participatory governance spaces such as food policy councils can play an important role. View a summary of the key recommendations from Melissa Poulsen and Marie Spiker’s study on urban farm integration here.